Owner of this picture is "EffGray" - I use two combination in this picture for Akihito. First one is down on the left side. The second one is also down on the right side "Monster Akihito" a use from this only his "walking" legs. From this picture i use only Akihitos smiling head down in the middle. Owner is "kuruoshishoujo"
And finally for Mirai i used this picture... His owner is "happytail73"
For background i used this scan as my inspiration. His owner is "mizzfunny"
I worked on this wallpaper 2days. At first i linearted all with the Ilustrator and then colored with photoshop. The end effects are light brushes, watercolors and at end i add some birds to the sky. I cant decide what version upload to Minitokyo. So i will upload both wallpapers. First one is with basic sky and water. And the second one is all more colored to pink. Nice vectoring and composing different scans to balance elements! I can see your coloring is now more stable in terms of choosing right colors. However lighting and shadows needs lots of improvement. 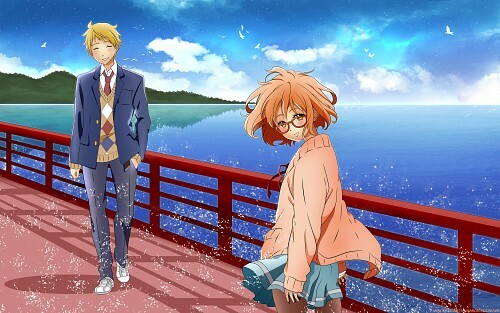 Like in this wallpaper the light source for Mirai is from left, Kanbara's from back left, but look at background especially the shadows casted by railings, the are on left side that means sun is on right side right? So the characters and background aren't blending (they look like they belongs from different sources of light) Also try to use textures on clothes, ground etc part they'll give some depth in your artworks. alenas.deviantart.com/art/Basic-Lighting-Tu(...) <------ Our Alenas has made an awesome tutorial for explaining how lighting works, it's really helpful so I'll recommend to read it thoroughly.